This work is from the summer of 2012, during which I interned on the metro desk at the Pittsburgh Tribune-Review. That summer offered me a chance to cover a variety of stories, including business, science, education and transportation. Here's some of that work. 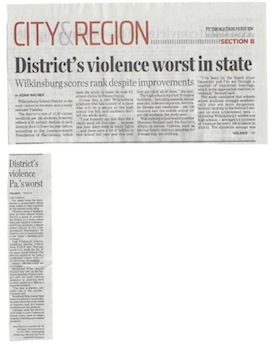 June 27, 2012 — Wilkinsburg School District is the most violent in the state, says a study released Tuesday. The district's rate of 47.23 violent incidents per 100 students, however, reflects a 33 percent decline in incidents in 2010-11 from the year before, according to the Commonwealth Foundation of Harrisburg, which used the study to make its case for school choice in Pennsylvania. 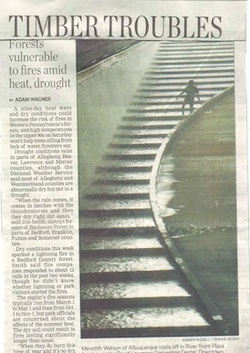 July 7, 2012 — A nine-day heat wave and dry conditions could increase the risk of fires in Western Pennsylvania's forests, and high temperatures in the upper 90s on Saturday won't help tree ailing from lack of water, foresters say. 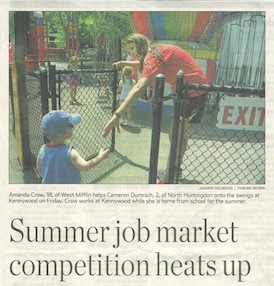 June 16, 2012 — Teenagers are losing out to older workers and even recent college graduates in their hunt for seasonal jobs this summer. The number of Pittsburgh-area teens with summer jobs fell from 31,480 in 2000 to 14,065 in 2011 — a decline of more than 50 percent — according to the Three Rivers Workforce Investment Board's Youth Employment Report.